his beautifully feminine oil is excellent in skincare for dry, mature and ageing skin. Rose Otto essential oil gives a boost to tired, lifeless skin that is need of rejuvenation. Its effect on the emotional system is uplifting, balancing and stabilising, particularly during the monthly cycle. Unashamed Luxury ! Introduction: There is quite simply, no other essential oil quite like it in terms of fragrance and wealth of therapeutic healing benefits. Rose Otto is the beautifully fragrant essential oil extracted from the species Rosa damascena, and holds a special place in the hearts of all who love aromatherapy and natural perfumery. Of all the places in the world where roses are cultivated, the are just a handful of regions in 2 countries that provide just the right conditions to grow this incredible flower in large enough quantities to produce Rose Otto essential oil! One such area is in Bulgaria, and the others are in Turkey - and both are connected by history. Origin: The origin of the cultivated Rose is often quoted as Iran. From the 10th to the 17th century the Rose industry was developed and dominated by Persia (former Iran), and particularly in Shiraz, the famous city of poets and oriental culture. From here the rose industry spread into Arabia, Mesopotamia, Palestine, Asia Minor (Anatolia) Greece, India, North Africa, and due to the conquering Moors reached as far as Spain. 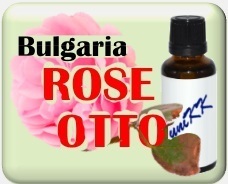 Valley of the Roses: Bulgarian Rose oil industry reigned supreme throughout the 19th century, almost monopolising the entire world supply of rose oil. This monopoly only ended due to dramatic changes in the political and economical climate after World War 2, when production fell into a steady decline. Climatic Conditions: In Bulgaria, the Rose blossoms of Rosa damascena begin to bloom around the third week of May, and will continue for three or four weeks depending upon climatic conditions. The yield of oil can be dramatically affected by the prevailing weather conditions - for example during very hot and dry weather the harvest may last only two weeks and the yield of the oil is lowered due to loss by evaporation. Conversely, during mild and humid weather the harvest time can be extended whilst at the same time increasing the oil yield. P.S. Some of our customers are from mainland China who feel 'secure and confident' to purchase the products in Singapore. Extraction: In the old days...hands!! In Bulgaria during the early 1900's, virtually all Rose oil was distilled on-site using direct-fire stills operated by the farmers. A suitable site would be chosen adjacent to the field and near a stream and the apparatus would be set up. Although this sounds rather primitive, the yield produced from this type of amounts to 1 kilo of oil for every 2,500 to 3,000 kilos of Roses. ** On average, Rosa damascena will yield 1 kilo of oil per 4,000 kilos of flowers using modern distillation processes. Under very favourable conditions only 2,600 kilos of roses may be required to produce 1 kilo of oil, whereas under less favourable conditions up to 8,000 kilos of flowers may be required to produce the same amount of oil. It's so good: Even the smallest drop of this beautiful Rose Otto excites your senses. ** Please check with your Aromatherapist for best consultation. As a perfume, the absolute can be worn directly on the skin – it's 'tenacious' quality will have the aroma slowly released for many hours. - a diffuser is very effective for this purpose as well. The absolute can also be added in small amounts to any skin cream, though using a home-made natural recipe is often the nicest. The great Bulgarian writer Ivan Vazov gave vent to his emotions which the lush landscape of the Rose Valley evoked in him back in 1886.